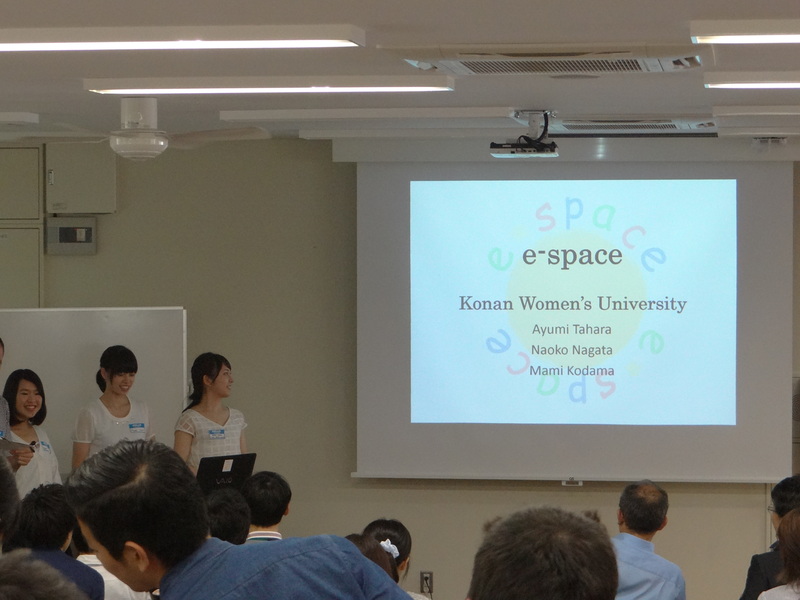 In this month’s Talking Points, Naomi Fujishima and Jim Ronald report and reflect on a student-led JASAL social learning space-focused event held in July at Okayama University . 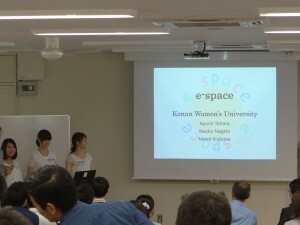 Jim: On Saturday July 11th, Okayama University, where Naomi teaches, hosted a JASAL (Japan Association for Self-Access Learning) event for students, administrators and teachers involved with social learning spaces (SLS) in a total of ten universities in the Kansai, Chugoku and Shikoku regions. The event was held in the L-café, which is Okayama University’s signature SLS. Before describing the event, though, given the range of self-access centers that there are, it’s worth recalling what a social learning space (SLS) is. Naomi: Well, in the March Talking Points we defined it as “a place where learners can come together in order to learn with and from each other”. And as we were talking the other day, we wondered whether another way of putting it is that in a social learning space the main resources are other people, not books or DVDs or computers, and typically fellow students, whether international or domestic. Jim: Yes, it makes it clearer for us anyway! So, to return to the program for the L-Café events, after a brief greeting from our hosts we kicked off with a two-hour Show and Tell of presentations by six groups of students and one teacher of the social learning space in their institutions. The presentations were really interesting and diverse, weren’t they? Naomi: Yes, I thought so! Each group did a great job at sharing the various challenges they faced at their SLS, and the audience was curious to know what each institution did, and how they did it. 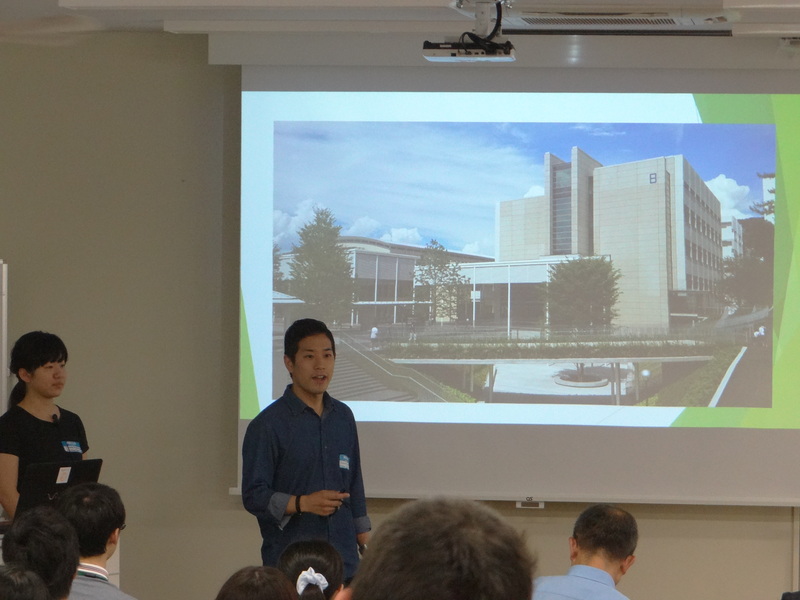 What was special about these presentations was that they were given largely through the students’ eyes, through their experience – they weren’t just representing their institution, they were representing themselves. Jim: Yes, this was clear when the students received questions from the audience. For example, after one European student described the L-Café as a safe, comfortable place to meet new people, a teacher in the audience asked why she couldn’t just make friends in the cafeteria. She responded by asking the speaker whether the school cafeteria really was a place where strangers struck up conversations. Naomi: I remember that. When you’re in the cafeteria, you’re usually with your own group of friends and busy trying to finish lunch before going to the next class. I really liked how each SLS had their signature event to attract new students. 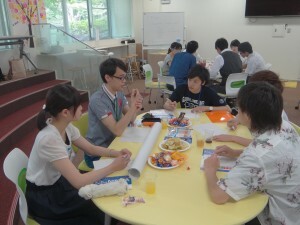 Hiroshima Shudo University holds mini-concerts and origami-making for peace, Otemon Gakuin University holds ‘coffee talks’ for students to practice speaking English, Konan Women’s University has a special ‘English Café Time’ during certain periods in the day, and International Pacific University holds ‘Got Talent’ events modeled after the famous ‘Britain’s Got Talent’ TV show. It was great to see so much imagination put into these events. I was also surprised at how many people attended! We were so pleased to see over 60 teachers, students, and administrators joining us on that day. It took a lot of work to organize and execute, but it was well worth it in the end. After the student presentations, there was another discussion session with students and administrators/teachers separating into two groups. While the various SLS managers, administrators, and teachers discussed issues of common concern, the students were put into groups with one representative from each university. Their task was to design an ideal social learning space and to make posters illustrating their ideas. At the end of this task, there was a plenary session where each group presented their posters of their ideal center to everyone else. 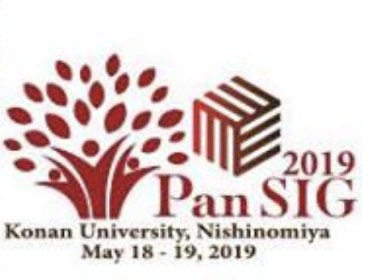 When the plenary ended, the students re-grouped into their own universities and discussed ideas that they could take back to their own institutions. 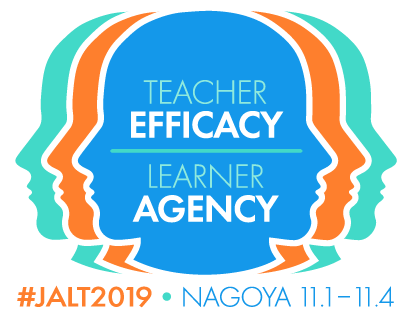 The funny thing was that we said it would be OK to speak either Japanese or English during the discussions, and most of them were talking together in Japanese, but when it came to the plenary session, all the groups presented in English with no prompting from the teachers! Jim: Yes, I’m sorry I missed some of this but I was able to catch these presentations. 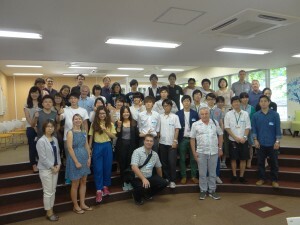 My impression was that the students had a much better time at the discussion session! The day’s event finished with gatherings of the participants from each university, which was a great way to end. We arrived as a group, and finished as a group, appreciating the whole event, and looking forward to seeing how we could implement some of what we had heard or talked about in our own SLSs. Naomi: We certainly have to thank Katherine Thornton, current president of JASAL, for her careful planning and coordinating of this event. The only way we communicated was by email, sending documents, schedules, and surveys back and forth. 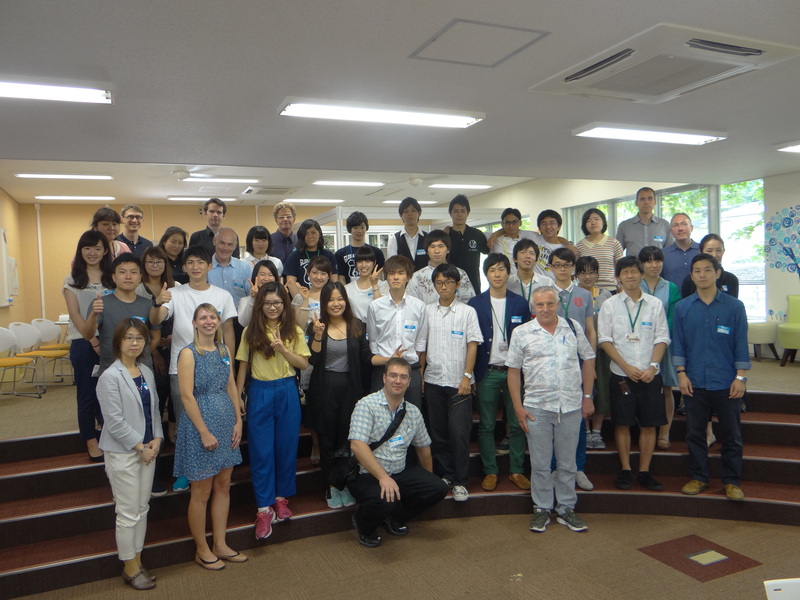 The first time we actually met face to face with her and Dirk MacKenzie (JASAL vice president) was on the day at Okayama University. It’s amazing how it all came to fruition so smoothly! Naomi: I know what you mean. To be honest, I had no idea what to expect but I was really happy to see so many universities represented on the day. For example, I had no idea that International Pacific University, which is in the same city as we are, had such nice facilities on their campus, so it was a very positive learning experience for me. Jim: One comment that impressed me was the advice or experience of just to keep trying out new activities, knowing that some will work and some will fail. And when they do, just to move on, without too much looking back. To me, somehow, “moving on” somehow caught the spirit of the event. Naomi: Yes, and talking of moving forward, I’m glad that Katherine has been thinking ahead by keeping the conversation going. She just recently sent out a message to the JASAL members with URLs and Facebook links to each university represented at this event. I plan to forward these on to the students who participated and perhaps post them on the L-café homepage so the discussion can continue. With the student population constantly changing at universities, as they are supposed to do, it’s really important to have these links available and kept alive for new and incoming students. Jim: I certainly agree with that. Among participants, within and between institutions, maybe even through this blog, it’ll be good to think of this discussion continuing and moving on.